Welcome home new little plane. Nice KitFox 7! I like the tail wheel converasion too. 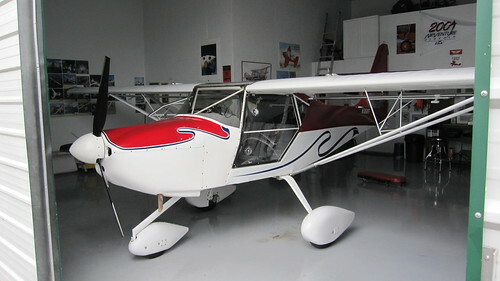 I’ve had my life turned upside down, but unbelieveably I was seriously thinking of building again and this airplane was one of my first interests, along with looking at a cub or versions there of. Glad to see everything is going Great for you, great flight videos and the hanger looks funny with the RV9A replaced with the KF 7! Hi Terry. Good to hear from you. Let’s get together sometime soon! we are in the process of ordering a Kitfox 7, super sport. the question is – what is the normal speed you can go with big front wheels like yours, or even bigger, when they are without their cover. let’s say with Rotax 912uls or with the Fuel injection system at 5,000 rpm? we would like to be able to land actually everywhere, but at the same time to fly around the 100knots..
My cruise is 125 MPH True Airspeed. 5000 rpm is quite low for cruising, I usually cruise at 5400 to 5450. It will go much slower at 5000.